This comic is tragically late, but here it is now. 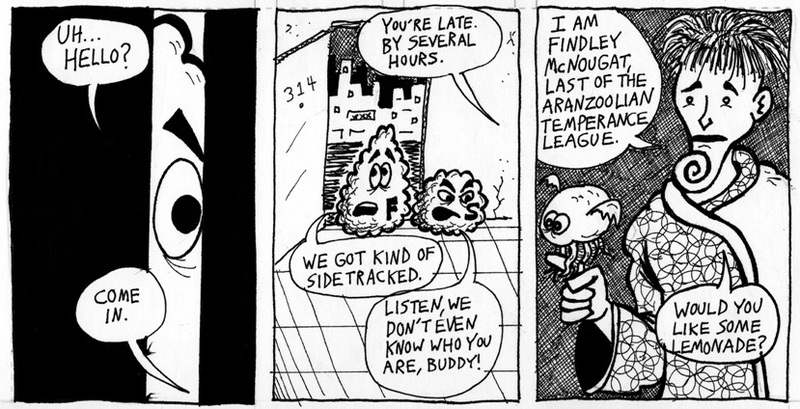 When I drew this comic, about ten years ago, I showed it to my friend Matt. His response was, "I get the joke, but it's not funny." To this day, I'm not sure what joke he was referring to. "Findley McNougat" is not a pun or allusion or anything, it's just another goofy-sounding name. If you look at that last line as a punchline, it's true it's not very funny, but it's not really a joke, is it? I believe Matt's comment was the only feedback I received on this 27-part story. That's the sort of thing that makes it hard for an amateur cartoonist to get out of bed in the morning. Don't forget to tune in for the next thrilling installment! Theory: The joke Matt was talking about wasn't so much a joke so much as an Easter Egg for people who make the connection between the two bubbles in the last panel (a guy who belongs to a temperance league offering lemonade). For it to really count as a joke, though, he would have need to offer them beer. You could be right. I don't think of that as a failed joke because, as you say, when a guy in a temperance league offers someone lemonade, it's not a joke, it's just what you would expect. Maybe I should have had him offer them beer.